Duchess Kate is well known for recycling her looks, but we didn&apos;t know she could throw it this far back! The royal, 34, visited the English city of Manchester on Friday, October 14, rocking none other than that classic &apos;90s hairstyle, the Topsy Tail. Don&apos;t remember? Allow Us to refresh! Back in the &apos;90s, Conair sold (and, yes, still sells!) an immensely popular kit that, with the use of a wand with a loop at the end, allowed you to easily make a ponytail with twisted accents on each side. Still not familiar? Here&apos;s a video tutorial. While it&apos;s safe to say that Kate&apos;s hairstylist, Amanda Cook Tucker, probably didn&apos;t need the wand to create the royal&apos;s twisted half-updo, it&apos;s nice to know that it doesn&apos;t take much to RepliKate her latest elegant style at home. In addition to the throwback hairstyle of our dreams, the duchess, who was joined by her husband, Prince William, also rocked a tartan Erdem coat over a black lace vintage blouse, plus pearl Oscar de la Renta earrings, a blue suede clutch and navy Rupert Sanderson pumps. The Duke and Duchess of Cambridge visited the city for a series of engagements, including a tour of the Manchester United building and the National Football Museum. 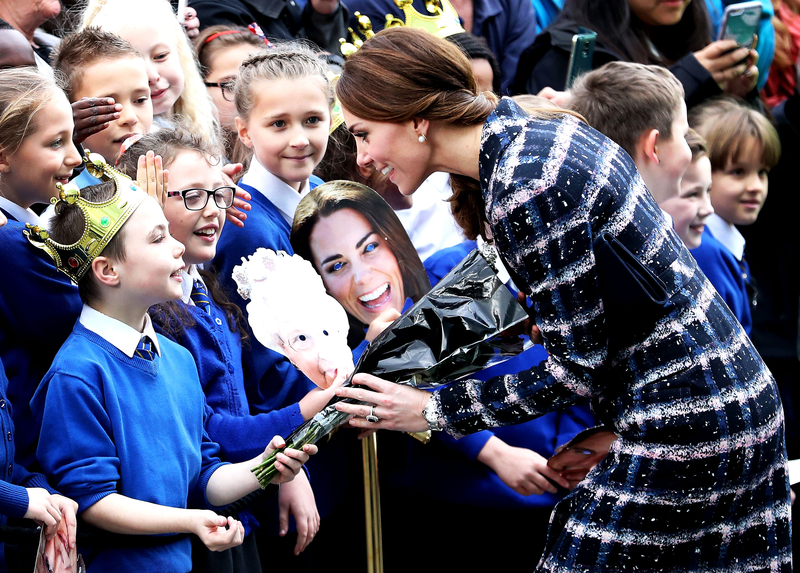 But before that, they were warmly greeted by schoolchildren who waved while wearing masks featuring William, Kate, Prince Harry, Queen Elizabeth II and even the queen&apos;s beloved corgis. While at the museum, William "nervously" held the 1966 World Cup Ball, Us Weekly&apos;s European bureau chief Omid Scobie, who was on the scene, shares, and participated in a penalty shoot-out. "The Duchess of Cambridge declined to join in because of her high heels," Scobie adds. After that, the couple laid flowers at a memorial honoring Manchester&apos;s Victoria Cross recipient, part of the World War I centenary campaign. They also visited the National Graphene Institute at the University of Manchester, a world-leading research facility, before visiting the site of the new Manchester Engineering Campus Development, where they helped seal a time capsule in the building&apos;s foundations. Finally, they visited Francis House, a hospice that provides care for children and young adults with life-limiting conditions. The hospice was opened by William&apos;s late mother, Princess Diana, in 1991, and thus is celebrating its 25th anniversary.